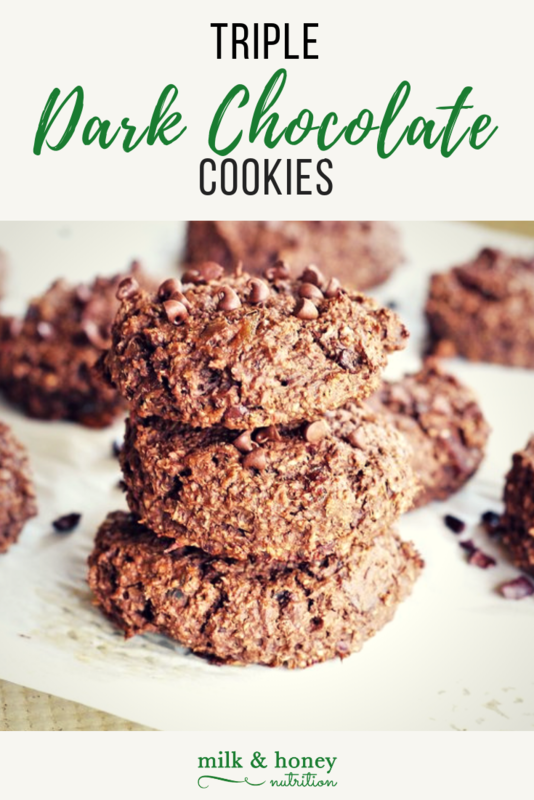 Imagine a cookie, so decadent, so rich, and so completely satisfying that you're happy with the way it tastes, but you're NOT craving another one and are satisfied with just one... sounds too good to be true right?! Nope. That's what these Triple Dark Chocolate Cookies will do for you. And you want to know why?? Because they're very low in sugar (sweetened only with dates), and filled with healthy fats, complex carbs, and plant based protein. I know you'll love them, and find them to be the perfect guilt-free breakfast treat, afternoon hunger buster, or late night (not so) sweet! *If you are going for an added sugar free dessert, use extra cacao nibs instead of the chocolate chips. Preheat over to 350 degrees. Add dates and water to a small saucepan and boil for 8-10 minutes. While the dates are boiling, combine all dry ingredients (except the extra chocolate chips) in one bowl, and all the wet ingredients in another bowl. Once the dates are done, add the liquid and dates to a blender and process for 60 seconds. (If your blender is not equipped to handle hot foods, wait until the dates and water have cooled off some before blending.) Add the date paste to the liquid ingredient bowl. Gently add the liquid ingredients to the dry ingredients and stir to combine. Scoop the dough using an ice cream scoop (or equivalent tool) onto a baking sheet lined with parchment paper. Gently press the balls/scoops into flat circles. Sprinkle additional chocolate chips (or cacao nibs) on top. Bake for 15 min. Let cool completely before eating. Store in an airtight container for up to 3 days or freeze.